Back in March of this year, I started a podcast, talking to friends about their hobbies they don’t normally discuss. I took it pretty seriously from the start and steadily did at least one interview a week for a few months. After all that work, I decided to take a break for the summer and line up guests on a slower schedule in the future, so I’ll likely have 1-2 episodes a month going forward. The newest episode is an interview with one of my favorite artists online, Darius Kazemi, who explains to me how he got into anime, what shows he enjoys, and how you can find something you’ll like amid the possibilities. It started as some jokey posts on Twitter, but lots of my fellow Gen-Xers have experienced rewatching an old 1980s movie they loved, only to find out it had a lot more casual homophobia and misogyny or awkward nakedness or generally just didn’t hold up when viewed today. So I said, “that should be a podcast!” and Erika Hall went and did it. Erika picked the first movie to review, Pretty in Pink, and asked me to be the first guest. Spoiler alert: there was plenty to talk about but the movie wasn’t as bad as I remembered. I think the first episode turned out pretty well and can’t wait to hear other guests and their favorite films come up over the next few weeks. Since each episode will have a different guest, I’m hoping to return in 4-5 more episodes with something I used to love in the 80s but haven’t seen in 30 years to review with fresh eyes. I legitimately, unironically find everything about podcasting fascinating: the making of them, the concepting of them, the listening, the learning, the incredibly intimate feeling of hearing something in headphones that sounds like it was made for just you. It’s like the early days of blogging, all over again and it’s a blast. I listen to several dozen podcasts, usually when doing boring tasks like errands, dishes, or car trips, on the order of 5-8 hours per week, and mostly at the expense of time I used to spend listening to music. Podcast discovery is still a mostly-broken problem, so I thought I’d share what I normally listen to, and how I prioritize them. To date, I probably found most of these on the word-of-mouth recommendations of a friend or random links in Twitter or Facebook. There isn’t really a good app to share podcasts quite yet (Breaker seems to be getting there), so posts like this will suffice. I hope you spot something you’re interested in, because everything here is something I’ve enjoyed. Also, if you run a podcast and see it on this list, know that I love you and your work but I only have so many hours in the day so I had to prioritize somehow so try not to take it personally if your podcast is low on these lists. I've long had a love/hate relationship with podcasts. I work from home, so I don't have much in terms of steady downtime to listen to podcasts. I find I can only enjoy them while doing intellectually non-demanding things like highway driving in a car or sitting on public transport. When I've had hours to kill on road trips and a slew of comedy shows I've had a good time but as my time gets more valuable I've culled my lists of shows to less than half a dozen I really love, and besides just one or two, I don't go out of my way to listen to them immediately after they update. When I finally tried out 99% Invisible after hearing so much good press about it, it rekindled my love of the form. First off, it's unlike every other podcast I listen to in that it's only about 10 minutes per episode instead of 90+min of talking. It is edited tightly so it's both packed with information and devoid of the common podcast deadtime of "so… what else is there to talk about?" There are always great interviews with experts, the website has a full word-for-word transcript of every show, and the subject matter is always fascinating even if I thought I wouldn't care at the start of each show. 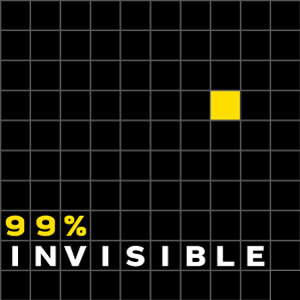 It makes me wish every other show I listen to tried to be as good as 99% Invisible (including my own). The short length, deep knowledge, and tight editing mean every new episode is a delight and also an insane amount of work for the guy behind it, Roman Mars (I've heard him say each episode takes about 40hrs of his personal time to create and having editing audio before I would fully believe that number). I would strongly recommend giving the show a try. Thanks to the short length, you can listen to half a dozen in an hour and quickly catch all the back episodes. If you end up loving this podcast as much as I do, by all means help it out by backing the next season of it over on Kickstarter. They've got a fundraising partner who will kick in $10,000 if they can get up to 5,000 backers and I'd really like to see Roman hit it. Last month I appeared on a couple podcasts as a guest. If you like hearing me blather on about stuff, you might want to check out both of these and give them a listen. The Mule Radio one is only about 30min long, the BoingBoing/Gweek one runs about an hour. For the last few years, I've regretted letting my long essay/business tips blog Fortuitous go fallow, and I've been thinking of bringing it back many times whenever I feel the urge to write more. The other day I was helping a friend with his new podcast and I realized there wasn't a single resource online that contained everything I'd learned, so I decided to write it myself. This essay is pretty much everything you need to know to get started podcasting with a Mac. I plan to do more of these, the next one will be on everything I learned after personally printing, selling, and shipping over 500 t-shirts in the past two years. Maybe in a few weeks I'll return to more business-y topics too.